It was a long process to sift through hundreds of road bikes and bring you the best entry level road bike for 2017. However, we put the hours and the effort in so that you didn’t have to, and to make your buying decision a lot easier. After the long and tedious process, we’ve chosen Vilano Shadow 2.0 Road Bike (best bang for your buck) and Tommaso Imola Road Bike (if you have a budget above $500) as the best entry level road bikes for this year. We decided on the top 5 road bikes by analyzing their features, price, and performance, and taking in the advice of cycling professionals. We took into consideration the reviews of hundreds of users, as well as our own experiences with riding road bikes. What we were left with was a comprehensive and complete guide for everything you need in order to purchase the best option in the market today. How did I Choose the Best One? Why Should You Trust This Review and Me? For beginner it requires some time for comfortable adjustments. Full internal cable routing offers clean airflow over the entire bike. Asymmetrically shaped chain stays are designed to improve power transfer and lateral stiffness. Today’s road bikes are beasts. These machines have evolved over the years and become one of the most efficient, durable, and high-quality sporting equipment in the market. Over the past ten years, the designs, tires, frames, brakes, and handles have significantly improved. The market is extremely competitive, and this is pushing manufacturers to design top-notch equipment that does the job right without complicated gimmicks. The result is a market overcrowded with road bikes that range to over $5,000 stock. For expert riders that have the capital to invest in a machine of that caliber, this price tag might be reasonable. However, for beginners, professionals, and other athletes, making the choice between performance and price can be a turbulent one. The good news is that, with the increased competition in the cycling world, a rider no longer needs to invest as much money to get good-quality equipment. 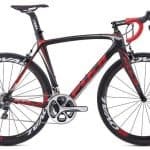 The purpose of this report is to review the best road bikes that are currently available and provide you with a comprehensive guide that looks at more than just price. By the end of this report, you will be able to comfortably make a decision on the road bike that fits you best. You will know the best features of each bike, their flaws, and what you can expect when you first receive it. If you don’t go with our first and second choice, you will have a few options to choose from depending on your needs. Moreover, if you decide not to go with any of the options in this report, you will be better equipped with the right information to go into the market and choose the best road bike for you. You will know what features to look for, how to pick out a great road bike, and what the competition looks like today. Regardless, you will be able to determine what road bike is best suitable for you based on this comprehensive and complete guide of the top road bikes in 2016. We used our knowledge of road bikes, testimonials from other riders, and reviews of our top picks to find the best road bikes in the market for 2017. In order to keep the review fair and accurate, we accepted absolutely no products from manufacturers and interviewed a few bicycle experts to get their thoughts and opinions. These bikes were picked after hours of research on the top road bikes in the market. Several factors were taken into consideration including price, performance, and innovation. The bikes that made the list were not only the favorites in the market today, but they also proved to be extremely durable, built with high-quality materials, and had overall excellent reviews. The bikes had excellent reviews, low complaint rates, and had a great overall appeal among riders. We also interviewed a few experts from popular cycling stores to provide their advice and thoughts on what makes a great road bike. We included their expert opinion and their reviews on bikes that they own themselves. Finally, we put all the data together in an easy to read, thorough, and complete article for your convenience. Vilano Shadow 2.0 Road Bike is one of the best entry level bikes for some reasons including the entire design. It comes with quite some impressive key features that make it one of the most affordable road bikes out there. Entry level bikes allow you t not only rain for your road bike feats but also commute whenever necessary almost tipping to what a hybrid may do. The bike comes with a 14-speed gear mechanism that is ideal for beginners. Most bikes will have 21-speed gears but will not be necessarily a good thing for the beginner who is trying to get a grip the whole system. This is less intimidating yet more satisfying. Weight is everything when it comes to a speed bike which is why the Vilano Shadow is made of lightweight aluminum. The 6061 butted aluminum aero frame is integrated with headset and integral cable routing creating compact frame and bike that not only fun to ride but convenient to handle. The design is impressive and great to look at. The 700c 11/8” tires are also threaded less for the best traction on tracks and smooth pavements. The tires are also built to last and bear the load without any mishaps. The shifters are Shimano A070 STI Integrated brake lever is designed to be precise during the shifts which are ideal for the beginner. Shimano is a great gear and lever designer that leave nothing to chance when it comes to putting the best mechanisms together. They are also easy to shift even for the entry level racer. The derailleur is also Shimano for longer lasting, better-aligned gears and sprockets. Gear failure can be daunting which is why picking bike with the best combinations will save you money in the future. It will also save you the embarrassment of slipping gears and chains. You also get Dual pivot caliper brakes for instant stopping power or this sturdy bike. The breaks are great as a standalone option but can also be upgraded to brake disks in case you are looking for more stopping power. The wheels are 700c double walled CNS alloy made that is machined on both sides. They are designed to absorb a lot of impacts while providing the much need aerodynamics for the rider and hence more speeds on the open track. The bike aesthetics are great if you are looking for a good-looking road bike. The frame is pleasant and something you would want to keep for a long time. One of the best things about this bike is the pricing. It comes with an affordable tag. This is considering the level of professionalism it puts on the table. You also get great quality parts for the bike including Shimano parts. The bike is lightweight with great aerodynamics for speed. It can also be used for both entry level racing and commute. Easy to assemble and also comes with extras such as the pedals. Buy Vilano Shadow 2.0 Road Bike! You can confidently say that this is ‘a lot of bikes’ for the pricing it comes with which makes it a great bargain. A great bike is an investment which is why the Imola is a force to reckon with when it comes to entry level bikes. This is a bike for entry level riders that want to go all the way. The features are not only impressive but satisfactory. The bike comes with a lightweight aluminum frame that is also compact. This is great for durability, non-corrosiveness as well as sturdiness. The frame also comes with a warranty with available drilled points for fenders and racks for those that want to use it for commuting purposes. This makes it a great hybrid for those that are interested in both worlds. The bike also comes with an SST steel fork for extra strength when it comes to impact and handling. You also get the best drive train out there. The 3X8 Shimano Claris Group set that is coupled with a 30/39/50T Claris Crank set, and a 12X25T Claris Cassette provides near flawless rides through various terrains including hills, flat stretches and a mix of the two without any trouble. The ride also gets a wide variety of gear options for all the available terrains for the most comfortable ride. Shifting can be a nightmare for an entry level rider which is why the best mechanism is crucial. The Imola comes with a Shimano Claris STI Shifter that provides a smooth, consistent shift all through no matter the prevailing conditions. The full group set setup provides top notch shifting and a quick response that is unmatched when it comes to road bikes. The geometry, comfort, and aesthetics of the bike are very impressive. The frame is compact with a beautiful framework combined with premium handle bars for increased handling, power and comfort. The sleek package is also designed for efficiency allowing long hours for the rider on the bike without too much fatigue. This allows the rider to get the most out of the bike consistently whether you are riding for 10 or 100 miles. The ergonomic design also provides perfect lumbar support for the bike which is a good thing for beginners. The bike is all that it is needs a professional to put it together. It needs well-tuned derailleurs, bolts and a specific performance related set up for the best outcome and safety. Buy Tommaso Imola Road Bike! This is a great bike for entry level riders that have relatively deep pockets and are looking for a great experience on a great bike. A strong foundation in any road bike is essential for excellent performance, comfort, and even style. This stylish road bike has a frame made of aluminum and carbon fiber. This ideal combination makes the bicycle both durable and agile for better maneuvering. It offers agile riding and easy handling, as well as an overall sophisticated look. Aluminum frames are some of the best that you can obtain in today’s market. Although slightly heavier than carbon fiber, this material will ensure that your frame lasts a lifetime when cared for properly. High-profile alloy rims provide further support for the wheels and keep them sturdy throughout your ride. These rims are also lightweight and allow for strong, front quick release. This bike also offers some of the smoothest brakings with its Promax alloy caliper. Lastly, the Schwinn Phocus 1600 features an incredible 16-speed derailleur and integrated shifters and SR Suntour alloy crank for wider gear range. All of this and more wrapped in a neat little package and made affordable for anyone looking to take up road biking. This beast of a machine provides some of the best performance of any affordable road bike. With a carbon fiber fork and 16-speed derailleur, this bike offers incredible speed in a lightweight machine that does everything higher-priced bikes can do. The Schwinn Phocus 1600 performs excellently in many terrains. If speed is what you’re looking for, this lightweight 16-speed bicycle will allow you to cruise for long period of time as well as any other high-end road bike. If you are looking to get into the world of road bikes, but don’t want to spend a fortune on a higher-end bike, then this is the ideal option for you. There’s no need to sacrifice performance over price as this little package offers it all in one. Some of the best features of this bike include comfort, top-quality braking system, and very stable wheels. The frame allows for upright biking which improves comfort over long trips. The padded seat and rippled handles allow for excellent seating and top-notch grip. Moreover, the seat is easily adjustable to your height for improved comfort. Whether you’re cruising for short periods of time, or for long trajectories, you can be sure to stay comfortable throughout the whole ride. The Schwinn Phocus 1600 features Promax alloy caliper road brakes for great breaking power. This allows for increased safety when riding in traffic and improved response time. Featuring alloy rims and spokes, this bike not only looks good but also feels good. The wheels are lightweight, sturdy, and very stylish! This is one of the medium-priced options in our list. Within mid level budget, this is an excellent option for both experienced and novice bikers. Considering the price tags on some of the other road bikes in the market today, this is actually a very reasonable price for a bicycle of this caliber. Last but not least, this is one stylish bike that you will look forward to riding. It has a sleek design, sophisticated colors, and modern look that is hard to beat. Overall, it is simple, modern, and stylish. Buy Schwinn Phocus 1600 Men’s Road Bike! The most expensive bike in our list is the Kestrel Talon Road Shimano. When we dig deeper into the construction, materials, and engineering that went behind the design of this bicycle, it’s easy to see where the price tag came from. The frame is constructed from a combination of 800K and 700K carbon fiber called Kestrel’s Enhanced Modulus Hybrid carbon. For those of us who are not engineers, this simply means that it is a lightweight yet stable frame that offers premium maneuvering. This is one of the best frames that you can find in the market today. It features a top-notch aerodynamic design and internal cable routing that is truly hard to beat. All of these features offer improved aerodynamics, increased speed, and top performance. Lastly, the specially engineered frame design offers a shape that further increases speed and comfort for the rider. This is one bicycle you don’t want to get caught in a race with. It’s top aerodynamic design and top-notch gear system offers excellent maneuvering that can reach incredible speeds on flat terrains. Many reviewers have claimed that this is one of the best road bikes to own solely because of performance. It features some of the best components that a road bike needs to provide top performance in many terrains. Moreover, it comes in 5 sizes that make it even easier to adjust to your height. This beast of a machine weighs only an incredible 20 lbs, allowing for extremely efficient uphill riding. It is stiff and responsive and features a great system that is hard to beat. This is excellent for professional riders, for training, endurance exercise, triathlons, and athletes. One of my favorite features of this bike is its incredible seat. The Kestrel EMS Pro Aero Seatpost lets you change the position of the saddle and adjust it to your liking. This does not only mean height, but you can also move it forward or backward depending on your needs. The carbon fiber frame is easily one of the best features of this bicycle. It significantly reduces the weight of the bike, improves responsiveness, and increases the speed significantly. Moreover, it features 11 speeds that shift smoothly for better riding and easier maneuvering. As mentioned before, this is one of the most expensive bicycles in the list but it is absolutely worth every penny. You will not get this quality, style, and performance on any bicycle of this or lower caliber. The frame is essential for a quicker response and improved speed as it decreases the weight of the bike significantly. The great system is hard to beat and the overall engineering of the bicycle is not found on any other lower-priced model in the market today. If you are looking for excellent performance that will not let you down, or if you are seriously training for an event, then this is the best option available in 2016. This is one fine-looking bike. Easily my favorite design in the list, this sophisticated bicycle features a sleek look with bright red handlebars and a dark frame. The Kestrel Talon Road Shimano is one of the most attractive bikes you will find on the road today. Buy Kestrel Talon Road Bicycle! Another excellent option for entry level riders and professional cyclists. As mentioned before, having a strong frame is the foundation of any high-quality bicycle, and the Giordano Libero 1.6 does not fall behind. This is one of the few bicycles that offer a handcrafted aluminum frame. The top quality frame is lightweight, durable, and certainly not bad to look at! The construction also features top-quality alloy rims and a 16-speed Shimano STI drive train. If you are looking for higher quality road cycling, this option offers many more benefits and much higher durability than lower priced options. It is popular among riders who are seriously considering entering the world of road biking. Moreover, it has proven to be extremely effective at providing great durability and performance thanks to its quality materials and ideal design. Giordano has been designing bikes for a while, and this is one of the best models they’ve released so far. The performance of the gears, combined with a lightweight frame and high-quality wheels, allows for high-speed riding over many terrains. The Giordano Libero 1.6 is excellent for flat, uphill, and downhill terrains. It does not suffer in performance when riding for long periods of time or at high speeds. Although the gears offer professional-level performance, they are actually quite easy to use and learn to maneuver. Whether you use it for entertainment, commuting, training, or exercise, this bicycle is certainly one that will not disappoint when it comes to performance. It is recommended that you tune up the bicycle after assembly and prior to the first use; however, it is actually quite successful without that initial tune-up. One of the coolest features of this bike (apart from the ones mentioned above) is its dual water bottle holder. Those of us who enjoy riding for long periods of time will understand the importance of this feature, as it allows you to ride longer without the need to stop for a fill-up. The 32 Spoke High Profile Quick Release Alloy Rims provide excellent support for the wheels. However, the Giordano is known to have lower quality tires. After several rides, it is recommended that one of the first things to upgrade on the Giordano Libero 1.6 is the wheels. This is a lower-priced option road bike that still offers incredible performance out of the box. Because of its lower price, you can expect that a few of the components will require upgrading after a few miles of riding. However, with a proper tune-up and a little bit of TLC, this is one entry-level bike that could last you for many years. Another cool feature is the black and red design across the frame. It is sleek, modern, and quite masculine to say the least. One of the most favorite things about the Giordano Libero 1.6 is actually it’s attractiveness and look. Although it comes in only one color combination, this is a design that most people find very attractive. 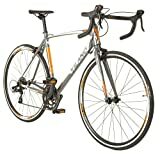 Buy Giordano Libero 1.6 Men’s Road Bike! The Vilano Forza 4.0 is actually one of the better quality bikes despite its low price range. It is a high quality and affordable option that is well suited for both beginners and professionals. Whether you need something for commuting, training, or fitness, this is a great alternative to look into. The frame is made with high-quality durable aluminum materials and it is lightweight and sturdy. The design features an aluminum frame with the steel fork and alloy crank. This excellent frame design offers a stable ride and improved comfort over a long period of time. Moreover, it is quite durable and can easily last for many years if cared for properly. One of the best releases made by Vilano is the FORZA 4.0. This bicycle can tackle flat terrains, uphill slopes, and the steepest of hills. The manufacturer has equipped the bike with 24 speeds to handle absolutely any situation. This complex design allows you to tackle anything from commuting in traffic or for riding on a mountainous terrain. The lightweight frame helps to improve stability and ease during uphill climbing and allows you to easily carry or lift the bike when required. The strong frame allows you to handle the bumps of the road, and shocks are absorbed much easier than other models. The gears can be easily adjusted, which is excellent for new riders who are not used to so many speeds. Therefore, you will find it quite easy to change the speeds even if you’re a beginner rider. Lastly, the STI integrated brake levers and alloy caliper brakes greatly improve the performance of the FORZA 4.0 by providing it with an excellent braking system. Overall, the performance of this bike is hard to beat at this price tag. The best features of the FORZA 4.0 include Shimano STI Integrated Brake Lever Shifters, a Lightweight Aluminum Frame, and 24 Speeds to handle any terrain. The frame is endurance tested and fairly lightweight. This improves your riding experience over long trips and makes it much easier to carry and lift. The shifters are very convenient for those of you who are new to riding, as it makes your experience much more enjoyable. Lastly, the 24 speed might sound intimidating, but it is actually very easy to handle and can take on any terrain. This is personally one of the best options in this budget range, considering all the excellent features and the top-level performance that this bike offers. With most other models of this caliber, you will likely not get the level of performance that the FORZA 4.0 offers. This is a medium-priced option. With all things taken into consideration, this bike hits a sweet spot between performance, quality, and affordability. If you are working on a tight budget and money is an issue, this is probably one of the best options for a road bike you can find in today’s market. The look of this bike is sleek and simple. It comes in a single all-black design which looks sophisticated and modern. Although there’s nothing special about the appearance, I love the overall look of it. The seats are known to be uncomfortable, and it is recommended that they are replaced. Buy Vilano FORZA 4.0 Road Bike! This is an affordable road bike option for the road cycling beginner. It is excellent for commuting, fitness, and rides around the neighborhood. The construction of the bicycle features an aluminum frame with integrated headset. It offers 7 speeds, alloy calipers, and a saddle with “anatomic comfort”. Overall, one of the best things about this lower-priced option is its lightweight frame. The weight difference allows for easy carrying, lifting, and uphill riding. the combination of rims, frames, and wheels offer a smooth ride and relatively easy maneuvering. Having the ability to easily learn the gimmicks and tricks of a road bike is extremely important for new riders, and this bike offers exactly. that. This model features decent gears that can reach speeds around 15 MPH. The materials used in the construction of this bike are dependable enough to provide you with a great first-time experience, and can easily last you for several years. The Vilano Shadow features integrated shifters and a lightweight aluminum frame that improve performance significantly. It offers precise driving and easy braking. It is convenient for entry level riders and commuters. Vibrations are reduced in long commutes thanks to an enhanced design in the frame and rims. This is ideal for riders who are looking for a long commute and find that the road can sometimes cause discomfort. Although vibrations are not totally removed, you will certainly feel the improved performance of the bike thanks to its ideal design. In general, it is a lot better engineered than other bicycles of this caliber. For riders around this budget, this is one of the best road bikes that you will find on the market. Many road bikes will require assembly upon arrival and the Vilano Shadow is no different. However, one of the best features of this bike is that it offers some of the easiest and quicker assemblies of any other bike. The only thing you need is a few basic tools, and you can be out the door in as little as 30 minutes (depending on how handy you are!). The brake levers are some of the most popular features of this bike. Although it is lower-priced than other road bikes, this manufacturer certainly did not sacrifice this feature and took into consideration the importance of having excellent shifters. The Shimano STI integrated brake levers offer quick shifting and braking and are a lot more accurate than other designs. Lastly, the aluminum frame and alloy fork are another favorite features of this model. Not only does it look great, but it also enhances performance, reduces weight, and increases speed. This is one of the lower priced options in the list. As we’ve discussed, we can see that the price certainly did not reduce the performance of the bicycle. This is an excellent choice for people who are starting to take up road biking, or for those who are working on a tight budget. Overall, this is certainly a well-rounded lower-priced option. The Vilano Shadow has a pretty standard design. It comes in either black or white, has a standard road bike handle, and the Vilano logo across the lower bar. To be honest, there is nothing special about the look of the bike. However, it more than makes up for it in performance and price. Buy Vilano Shadow Road Bike! Our “buying guide” for choosing the best road bike in 2016 included an analysis of its quality and performance. Following are the considerations we used when picking our top 5 best road bikes of 2017. Each of these considerations was weighted equally against each other, allowing for a well-rounded analysis that ultimately resulted in the best road bicycle in the market. When it comes to construction and style, we looked for bikes that were expertly crafted and had excellent engineering behind them. Aerodynamics, durability, and materials are among the top things that we looked for when considering road bikes for our report. When choosing a road bike, you need to look for a sturdy frame built with steel, aluminum, carbon fiber, or titanium. Each of these materials will result in a different quality, weight, and durability; however, they will all be appropriate for a good-quality road bike. We are looking for a balanced bike that provides both reliability and robustness and has proper frame thickness. Moreover, the design should be able to absorb the roughness of the road and keep you sturdy and comfortable in long commutes. Performance is one of the most important factors for many people. A road bike’s components are what makes a road bike efficient and reliable. When put together, these components work harmoniously and provide excellent performance for the rider. Components include gears, wheels, brakes, seats, and pedals. We looked at each component separately, determined their quality, and analyzed how they work together in a group. When it came down to gears, we took it a step further and analyzed how many options there were to choose from, and which had the best bang for your buck. Many road bikes today offer a variety of features to make your riding experience that much more enjoyable. Each bike is made differently. Whether it’s different materials, design, manufacturing, or style, having the right features ensures that you achieve top performance and enjoy a comfortable and smooth ride. Some of the features we considered were the frame and fork, drivetrain, how many speeds in comes with, caliper road brakes, crank, and other accessories. The quality and materials used for these components make a huge difference in your riding experience. Whether it is better absorption of road vibrations, improved braking, or higher quality shifting, having the right features will improve your performance, comfort, and overall experience. Prices are a huge factor when it comes to road bikes. These bikes are high-performance, top-quality machines that usually come at a high cost. People looking to purchase a new road bike understand that the price tag can be quite steep; however, it is completely worth it if you choose a great quality bike that is shown to last you a lifetime. We looked at road bikes that ranged from $400 to $1,500 in the last quarter of 2016. Price is a big factor for many people and when it comes to road bikes, the recommendation is to never go cheap. We have chosen a price range that we believe will cater to most serious road cyclists, and will provide you with a wide range of choices that will fit most budgets. Although all of the above might surpass appearance in importance, this is still an essential factor to take into consideration when choosing a road bike. We are looking for something that is elegant and stylish. Styles that fit most personalities and could be used by both men and women. When looking at appearance, we want something that has a sleek style and can be adopted by most personalities. We are looking for something modern, sophisticated, and cool. Appearance can be very subjective. What looks good to someone might not necessarily look good to everyone. This is why appearance can be a tricky factor to deal with when it comes to many cruiser bikes and hybrid bikes. Luckily, most road bikes are made for performance, not aesthetics. So, a lot of the bikes in the market have a simple look that often caters to most people. Nevertheless, we still want something that will appeal to most riders and provide a look that’s attractive on the road. Throughout our report, we made sure that these factors were taken into consideration. We love bikes and bikes love us. We have been working in this industry for over 10 years, and are experienced in a wide range of topics including road bikes, cruiser bikes, hybrid bikes, and everything in between. Unlike other reviews, we do not work with manufacturers and don’t receive any products. Therefore, you can be sure that our analysis is accurate and not skewed by sponsored products. Our purpose is to bring you accurate information so that you can easily make a buying decision and reap the rewards of owning a high-quality road bike. All things considered, we are just a group of bike enthusiasts who are passionate about what we do, and we want to bring the joy of cycling to the rest of the cycling world. We believe that spreading knowledge about cycling and providing you with free information about what to look for is something that riders need but seldom find. This is why we want to make it easier for them to find the essential information that will assist you in exploring the world of biking and to adopt this wonderful hobby. If you are looking to purchase a new road bike, then this guide is for you. Whether you’re a professional, expert, beginner, man, or woman, this guide will provide you with everything you need to know to make an accurate decision based on real data. We also cover a wide range of budgets in order to cater to a wider audience. Whether you’re looking for an affordable alternative or a higher-end road bike, we got the review for you! After hours of researching, reviewing, and interviewing experts on our top road bikes of 2017, we’ve come up with the absolute best bike to purchase in 2017 – The Kestrel Talon Road Shimano 105 Bicycle. Although this is the most expensive bike on the list, it provides with everything you need to achieve the best road bike experience of any road bike available today. The quality of the build, materials, and overall performance are uncanny compared to any other bike in the market today. The specially designed frame is a beautiful combination of carbon fiber materials that make this one of the unique options on the list. It has been engineered beautifully and weights an insignificant 20 lbs, making it perfect for seamless uphill riding, easy lifting, and effortless carrying. We analyzed the overall performance of the bicycle and this one beat the rest by a landslide. Of all the relatively affordable options in the market, the Kestrel Talon Road Shimano 105 Bicycle offered the most high-quality performance, comfort, and features of any other bike. It is quite easy to handle even for a beginner and has some of the smoothest shiftings of any road bike. This sleek bike offers incredible flexibility so that it can be used for cruising or for intense endurance training. Rarely will you be able to see a bike that can be used for day-to-day commuting as well as a triathlon, and this is what The Kestrel Talon Road Shimano offers. Aerodynamics did not stay behind during the engineering of this bike. Built with a top-quality frame and tubing, this bike can easily reach high speeds with ease and comfort. It is stiff and stable which is essential for a smooth and comfortable ride at high speeds or during long trips. Moreover, state of the art gearing systems will let you increase and decrease your speed without any hassle. The stability of The Kestrel Talon Road Shimano is uncanny. There is nothing better than riding at top speeds and not having to compromise on comfort. The specially designed frame and rims will let you reach high speeds on the pavement and allow you to ride on most terrains. The bike is extremely durable as it is built with high-end components and materials. When cared for properly and used as instructed, this bike can last you forever. However, if it doesn’t, the bike comes with a lifetime warranty that includes the high-end components. Overall, you can be sure that this modern-looking, top of the line, a premium road bike will last you for years. If you are looking for your first road bike, or to replace your old one, this will be your best choice in 2016. The price tag is quite high compared to the lower-end options; however, every penny is worth it. Today, you won’t be able to find this kind of quality in any other lower-priced options. Our second choice for the best road bike to buy in 2016 is a perfect mix of affordability and performance. This bike offers an affordable option but still great quality for both entry-level riders and professional cyclists. Our runner-up for the best road bike to buy in 2016 and the best bang for your buck is the Schwinn Phocus 1600 Men’s Road Bike. Schwinn has been a trusted bicycle brand for many years for good reason. They have released many great-quality bicycles and improved the art of cycling through their years in business. This model features amazing performance and quality at a lower price range than other road bikes in the market. It is very durable much like Schwinn’s other products, and very fun to ride. The aluminum road frame fits the body perfectly, allowing for a very comfortable riding experience. It is also very well-designed and engineered for smooth riding, absorbing most of the vibrations of the road. To compliment this awesome frame, the designer added a carbon fiber fork, durable alloy wheels, and alloy caliper pull-brakes. All of these put together in a perfectly packaged road bike offers a smooth riding experience across many terrains. This is a fantastic option for those looking to get into the world of road biking without breaking the bank or sacrificing performance. When it comes to health and fitness, this model will have you hitting the road at all times. It is very easy to handle which means that you will love riding it, helping you get in shape faster. This lightweight model is perfect for effortless uphill riding and can be easily lifted over the head. Its rigid frame allows you to easily maneuver the bike and adjust yourself to changing road conditions. Whether you need to avoid an unforeseen pothole or rebalance yourself while riding downhill, this sturdy frame will let you easily readjust. the 14-speed derailleur is another favorite feature of this bike. The gears effortlessly shift and can be handled even by the least experienced riders. When it comes to aerodynamics, this bike gives you everything you need and more. It has an intelligent design that gives you just the right amount stability and aerodynamics and maximizes speed and efficiency. With the right posture, you can attain top speed like you never thought you could. Uphill is also much easier thanks to its 14-speed option. Having this range allows you to effortlessly climb up without the need to put unnecessary effort on your legs. The wheels are durable, lightweight, and supported by high-quality alloy rims. Other great features of the bicycle include top-notch brakes, alloy calipers, and an adjustable saddle. You can easily modify the seat to your height and comfort, greatly improving your riding experience. If you thought it couldn’t get any better, you are wrong. This bicycle surpasses many of its competitors when it comes to features and performance. At this price range, it’s difficult to find options that give you this quality of riding and top performance. Whether you’re training for a professional race, or you’re an entry-level road cyclist, the Schwinn Phocus 1600 Men’s Road Bike will absolutely not let you down. The most attractive feature of this bike is its affordability and price range. Regardless of your budget, the Schwinn Phocus 1600 Men’s Road Bike will let you reach your road biking dreams without breaking the bank or making a huge investment. This simple design offers extraordinary features at one of the most affordable price tags on the market. Moreover, the limited lifetime warranty on the frame makes this a must-have-bike for beginners and professionals.